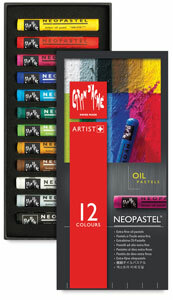 Neopastels are professional quality oil pastels with superb smoothness and blendability. These pastels are absolutely dustless. They are made from permanent pigments that are equally suited to intense coloring, delicate shading, and subtle transition of hue. Individual pastels measure 64 mm × 9.5 mm (2-1/2" × 3/8"). Set of 12 — Includes one each of White, Light Gray, Black, Yellow, Ochre, Brown, Scarlet, Purple, Ultramarine, Light Blue, Emerald Green, and Yellow Green. Set of 24 — Includes one each of White, Light Gray, Gray, Black, Yellow, Orange, Ochre, Salmon, Brown, Russet, Scarlet, Purple, Mauve, Violet, Ultramarine, Cobalt Blue, Light Blue, Turquoise Blue, Malachite Green, Emerald Green, Jade Green, Yellow Green, Lemon Yellow, and Light Olive. Set of 48 — Includes one each of White, Light Gray, Gray, Dark Gray, Black, Yellow, Pale Yellow, Olive Yellow, Golden Yellow, Orange, Orangish Yellow, Ochre, Olive Brown, Raw Umber, Flame Red, Salmon, Brown, Vermilion, Russet, Scarlet, Salmon Pink, Carmine, Pink, Purple, Light Purple, Lilac, Mauve, Violet, Periwinkle Blue, Ultramarine, Sky Blue, Sapphire Blue, Prussian Blue, Cobalt Blue, Light Blue, Turquoise Blue, Malachite Green, Turquoise Green, Emerald Green, Jade Green, Grass Green, Moss Green, Dark Green, Yellow Green, Lime Green, Lemon Yellow, Light Olive, and Olive. 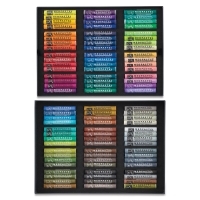 Set of 96 — Includes one of each of the colors in the Neopastel line. 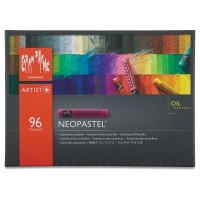 Neopastels are a professional quality oil pastel with excellent smoothness and blendability. They're made from permanent, lightfast pigments that are bright and vibrant, even on dark backgrounds. These dustless, opaque pastels glide easily on paper, but also work great on a wide variety of substrates - they'll even stick to non porous surfaces like glass and plastic! See why Caran d'Ache Neopastels are a great oil pastel.